Hosted by renowned guitarist and rock music aficionado, Nic Rush, Six String Stories tells the history of the electric guitar in popular music. It kicks off in the early days of bluesman Robert Johnson, hurtling through the 60’s rock sounds of The Beatles, Jimi Hendrix and Santana, stadium 80’s radio rock by Dire Straits, Prince and Van Halen and into the more modern anthems of Nirvana and Guns n Roses and many more...... As well as vocals by Nic Rush himself, the concert will also feature the vocal talents of Josh Ansley, the popular runner up of The Voice SA season 2 on Mnet and power-house Diva,Tracy-Lynn Brainers along with a dynamite young band. This show is not to be missed!! 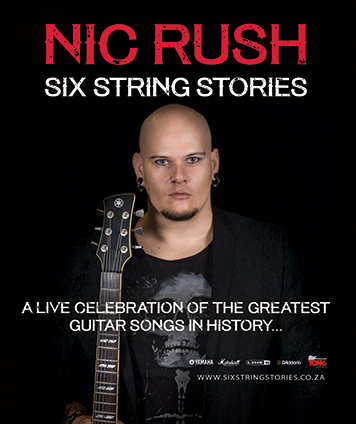 Nic Rush is one of South Africa's most highly respected Rock Guitarists and has played with the likes of SA stalwarts Watershed, Prime Circle and and The Parlotones. “The history of the electric guitar in popular music is incredible” says Nic Rush, “In Six String Stories we tell the story of the guitar by playing some of the biggest guitar-driven hits of all time. Their riffs and melodies are instantly recognisable and helped bands like The Beatles, Dire Straits, Van Halen, Guns 'n Roses and The White Stripes, all featured in the show, sell millions of albums. This show is a tribute to the greatest instrument on earth and the songs that define it” As one of the country's most highly regarded Rock Guitarists, from 2003 to 2011 he served as lead guitarist for one of South Africa's most successful bands at the time, Watershed, earning himself 3 Gold and 2 Platinum Record awards, playing on every major festival stage in South Africa and numerous overseas tours to Germany, Austria, Switzerland, U.K., the U.S.A, Dubai, Bahrain, Swaziland, and Mozambique. From 2011 to 2013 Nic played guitar in Brent Harris and Thee Jam with legendary South African drummer Brent Harris, and still performs with Brent at various gigs to this day. In 2013 Nic was offered a position at The Barnyard Theatre Company as a Musical Director, Lead Guitarist and Vocalist and left the company in June 2017 to pursue other musical ventures. Nic is a very proud Yamaha Endorsee and has used Yamaha Acoustic and Electric Guitars exclusively since 2011. He is also Endorsed by Marshall Amplification South Africa, D’Addario Strings, Planet Waves Cables and Accessories and Line 6 guitar effects.